Peter’s style is demeaning of anyone of the establishment. He has a sneering style. Peter has written a book that is too verbose – wordy. A good editor could have cut the book by about two thirds and it would have been a more enjoyable read. 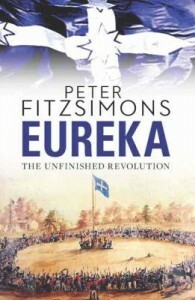 Readers in the group learnt a lot of background information about Eureka. Readers were upset by how the colonists treated others. This entry was posted in Australian Authors and tagged Author, Book Club, book review, books by admin. Bookmark the permalink.